26 | April | 2010 | Through the seasons before us..
Have you ever wanted to ask John Motson a question? He’s the ‘Marmite’ of commentators, is Motty – indeed, in reading up a bit about him I discovered he was in the same year at school as Gary Newbon – who’s quite similar in that respect! (although I bet Motty wouldn’t mistake Nottingham for Birmingham if he were asked to compere the Clough Statue unveiling!). Tell you what too, I bloody hate Marmite. I’m quite a fan of Motty, though. He’s been reporting on sport for the BBC since the late 1960s – and as such has been an ever-present soundtrack to my football supporting career – and, indeed, even on computer games! It’s true that he’s become a little more erratic in his later years, but that kind of adds to the charm – doesn’t it? As a man who has tolerated the never-ceasing irritation of having to listen to Mark Lawrenson speak, possibly more than anyone else on this Earth, I would imagine he must be quite high up on the list for getting a Sainthood too. Either that or he’s perhaps deaf in one ear. Why am I talking about John Motson, anyway? Well – for those of you that didn’t immediately read the flyer above – an interesting opportunity to meet the man behind the Sheepskin is yours to grasp here in Nottingham. Because in his last engagement before jetting off to South Africa for the World Cup, he’ll be doing ‘An Evening With…’ right here in The Approach. 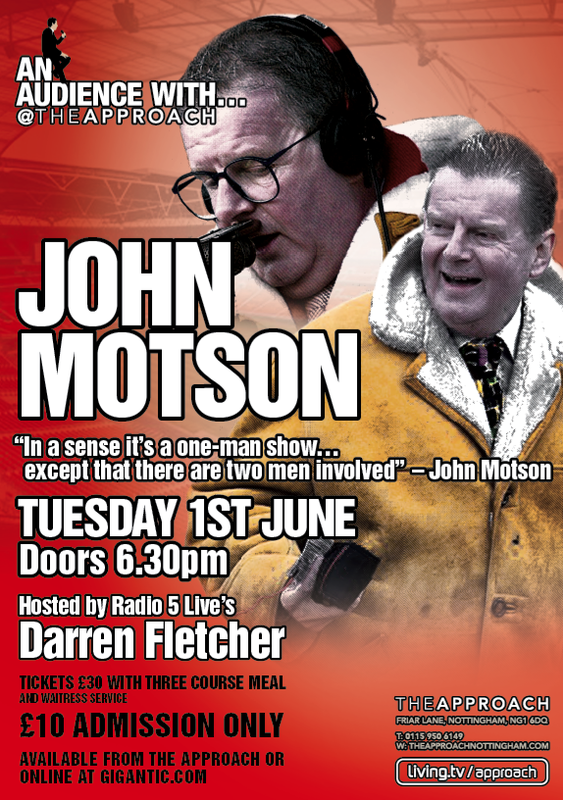 If you’d like to quiz Motty about any number of his famous comments or gaffes, or just hear about his distinguished career then pencil 1st June 2010 into your diaries – and book your tickets just here. If you don’t want to do the online booking then you can always pop into the venue to pick up some tickets. Just £10 to get in, or £30 with a three course meal! Click the flyer, or just here, for full details.